Businesses with brick-and-mortar stores or those targeting specific locations must provide discrete, optimized location pages to truly maximize their visibility for local searches. Templated location pages with thin content aren’t going to cut it here. If you want to really grab the attention of eyes scanning the SERPs, you will need to put in some serious effort. Each year brings about new changes in the SEO world, so it’s important to keep up to date with best practices in order to ensure that you get the most out of your work. Here is how I go about optimizing location pages in 2017. Before we begin, I want to note that location pages are just that, pages based on a store’s physical address. If you have a location that services surrounding areas, but you lack a physical location in that service area, then you should look to other strategies such as creating service pages for each city or area code that you service. You can learn how by reading this guide on how to rank for multiple cities. What if you have a large number of locations or service areas? Check out this Whiteboard Friday post by Rand Fishkin to see how to scale local landing pages. How about if you are a large, national company seeking more presence within a specific locale? This great post over on the Moz blog has got you covered. Another thing to note is that the optimization efforts in this post only encompass on-page optimization. If you want your pages to rank higher, you must obtain links as well. Local citation building and link acquisition are going to be the ways to accomplish this. A large portion of your users will be browsing your location pages through mobile devices. Don’t have a responsive/mobile site? Get one. Seriously, get one now. There are a lot of studies, such as this one by Akamai and Forrester, which show that users do not like waiting for a page to load. On average, they will leave a page that takes longer than 2-3 seconds to load. I present a lot of items in the following sections. Be careful when you optimize your landing pages. Stuffing everything on one location page without any thought to layout or usability is a recipe for disaster. Here is an infographic detailing legitimately good items to place on your landing page. The problem? It looks terrible! Such a page does not present your business in a professional manner and can hurt you more in the long run. With all of that out of the way, let’s get started with the actual location pages. I am assuming you did your keyword research, right? I usually try to see if there are any keywords that really stand out for a specific location. If the client is a painter, are there any keywords that stand out for the particular location that they service or have a physical location in? 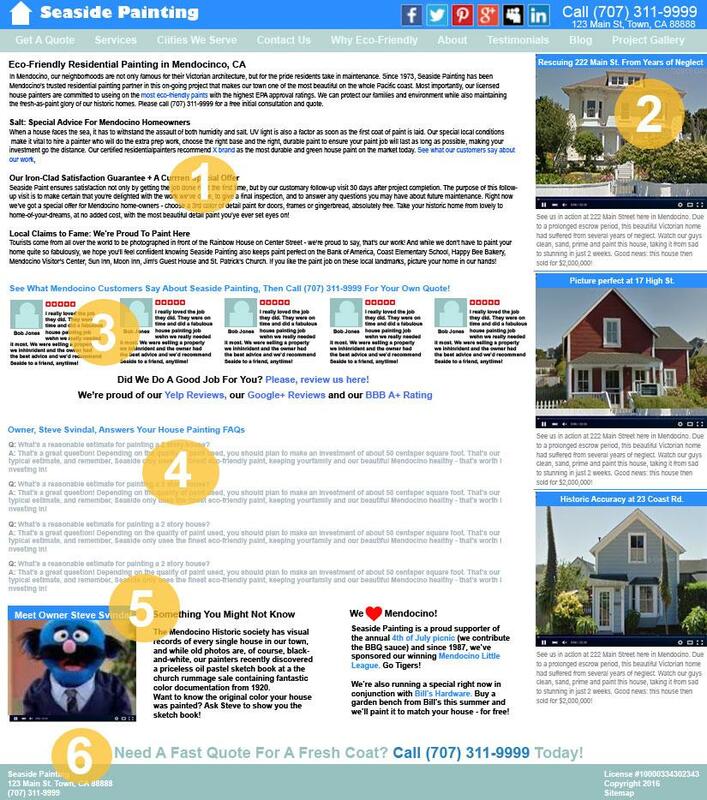 For starters, here is an excellent article on taking care of your on-page elements. On-page elements. We know them, they are fairly easy to implement, and they provide search engines with signals on what your page is about. Here is how I optimize location pages for on-page elements. Keep a consistent information architecture, don’t bury your location pages deep within your site, and use sensible URLs. Take some serious time in developing a good URL architecture and think about scale. If you have both a www.example.com/locations and a www.example.com/service-areas, what happens when you open a location in an area that you only serviced before? You may have to move/remove the service-area page and set up a new page under locations. Also, think about how granular you want your architecture to go. Will your location pages only list major cities(example.com/locations/atlanta), or are you a franchise with the possibility of multiple locations per city (example.com/locations/kennesaw/barret-pkway and example.com/locations/kennesaw/cobb-pkway)? Your meta description is pulled from your page by search engines and will display right underneath the title within SERPs. Although not a ranking factor, it is valuable real estate on SERPs. Craft copy that includes keywords in sensible ways, grabs the searcher's attention, and convinced them to click on your result. Utilize headings more for functionality and organization and less for SEO. I usually go for something sensible. Content counts, it’s as simple as that. Craft unique copy for each location page and utilize relevant local keywords. Write for users first, search engines second. Talk about the location in a meaningful way so that users immediately know you are a local, a neighbor, and a professional who is there to help. Mention how long you have been in business in that area and why your company stands out among the rest. I put almost no effort into keyword-optimizing the text above. When your content follows a natural flow, the keywords many times reveal themselves. Yuck. There are so many other ranking factors to consider when doing proper SEO than just keyword usage. Don't overthink it. Unnatural keyword placement is so ineffective these days that you will end up hurting yourself more because any traffic you actually do get will leave after thinking your copy was probably written by your six-year-old son. Check out capture below. The start of this copy is personalized and really gives off the sense that this isn’t just a template. Also note the great inclusion of the Store Manager’s name, another little snippet that adds a unique layer to this location page. Include your location’s Name, Address and Phone number on the page. Do not include NAPs from other locations on the page. I have seen pages list a “see nearby locations” section that lists other location's NAPs. These can confuse search engines when they are going through the web compiling lists of what each location’s NAP should be. These are used by Google, for instance, to list your location on Maps if you haven’t done any Google My Business Page setup. Keeping NAPs consistent across the web and providing only one NAP per location page will reduce the chances of search engines listing incorrect information in their results. Include information about your store hours, accepted payment options, and anything else that you believe is relevant and valuable to your customers. Make it easy for people to find your business. Adding directions adds yet another area of text to the page that helps make it unique. You can even add mentions about what times traffic is busiest, or integrate with an external service showing traffic currently around your location. You can take this further by integrating with Google Maps so that individuals can quickly type in their address and find directions (or at least click on a link that takes them to a Google Maps page). Display any awards, certifications and other trust symbols on your page. Don’t have any trust symbols? Get them! There are many local services that you can look at. These include symbols such as an accreditation from the Better Business Bureau. Proudly display your security badges such as those provided by Norton, McAfee Secure, Truste and others to assure visitors you are actively protecting their information. Do you have any awards or honors that your business receives? Display them! Are you involved with any charities, Little League games, or other events that your company sponsors or plays some role in? Placing images or other indicators for such items on your location page is yet another signal to both humans and search engines about the quality of your search page. You can take this even further by including a calendar app on your page that lists upcoming events. This is not only just a trust symbol, but an extremely important ranking factor overall for search engines. Having a large quantity of good reviews on and off (Yelp, Google My Business, etc.) your site will help you rank locally, especially within the map pack on SERPs. Provide links to your Yelp, Google Business and others directly on your location page. Make it easy for people to review you! This page includes both reviews and testimonials! Also note the inclusion of the Trustpilot score on the page. These are a little different from reviews. If you conduct brief interviews with customers, you can gather testimonials and post these on your site. Bonus points if you can get a picture of your customer or even better, a video testimonial! Since testimonials and reviews are so important, I always advise clients to craft an incentive-driven strategy for consistently obtaining reviews and ratings. These are one of the single most important drivers behind a successful local SEO strategy. I have seen a lot of businesses rank first in their area on Google’s map pack (and thus on the top of Google) simply by having a large amount of quality (4-5 star) reviews. Posting high quality photos of your location is a great way to not only add unique content that clearly differentiates one location page from another, but is also a good opportunity to really show off why others should visit your business. Do you host events at your location? Display them in the photos! This can be calling a phone number, filling out a contact form, connecting via social media, signing up for an event or whatever other goal your location page may serve. Look at all those CTAs! I especially like the "Apply for Job" CTA. I haven't seen that one used on many location pages. Very nice. Embed your location on Google Maps within your location landing page so that customers can have a clear way of finding directions to your location. Notice the nice NAP right next to the maps embed? Check out this excellent infographic that summarizes many of these important items. And here’s another, just for kicks. Does your local store have its own Facebook, Twitter, etc.? Post links to each social media account on your location page. Want to take it further? Pull in tweets and other social media posts and display them on your location page. These are excellent, localized signals that add a lot of uniqueness to your page. Here is an infographic that will help you to visualize this a bit more. Make it easy for your visitors to connect with you! Once we have all of these elements on a page, the next step I take is providing additional meta data for many of these items. Schema markup is data that you place within HTML to give additional signals to search engines as to what the HTML elements are all about. If a certain element contains a business phone number, then schema markup will help you label that element as a phone number for search engines. Why is this useful for us? Well, let’s look at what Google will do when it encounters some schema, like a review or rating for example. See how Google placed the 5-star rating right in the results page? That 5-star rating makes this one eye-catching SERP listing. Now, Google may or may not use your schema-optimized HTML in SERPs. Sometimes it will even crawl a page and use items in its SERPs without the need for schema data. But, you are much more likely to get your data in SERPs in this fashion if you add the markup. A 5-star rating next to your result in the SERPs will go a long way. There are plenty of plugins available for adding schema markup if you are using a CMS like Wordpress. Otherwise, you can always consult with your website developer. It isn’t too difficult to do if you have a little bit of experience with HTML and have access to edit your pages. Check out this great tutorial to learn the basics. Google also offers a free schema testing tool to check if your markup is valid. There are also plenty of youtube videos as well as free schema generators that provide GUIs for creating schema markup that you can then just hand off to a developer. This isn’t really something I implement personally, but rather advise as an important strategy. Many businesses allow their individual location managers or franchisees to take care of their own pages, social media accounts and advertising. This can quickly result in abandoned social media pages, messy private domains and loss of a congruent brand identity. Expand this to your Google My Business, Yelp listings and other citations, and the potential for problems to arise becomes even greater. Luckily, there are ways to handle all of this and still maintain control of your brand. Centralize your efforts in-house and provide clear protocols for adding content to location pages, social media accounts and anything else that may ultimately end up on your location pages. Have one resource for managing all citation building. Establish a NAP that will be used on your site and throughout the rest of the internet (Yelp, Four Square, etc.). Centralize your social media! Do you have a million different Facebook pages? Facebook Business allows you to manage them all from one page. Similar strategies can be applied for the rest of your social media accounts. If in doubt, get the help of a social media manager. Keep track of your domain names. Don't let individuals create and use your name across the web. The easiest strategy is to implement a CMS where all location managers can be provided access to their own location page that they can edit. These are some of the most common (and detrimental) mistakes I see on location pages. Make sure your location pages are crawlable. I often see location pages that are only viewable through some sort of embedded map applet. These are fine, but include a section of your site that lists your locations in HTML format with clear links to each individual page. Take time to future-proof those URLs. Don’t let your information architecture fall apart as your business begins to expand. Maintain consistent NAPs across your pages and the rest of the internet. Avoid duplicate and/or thin content across location pages. Keep your site updated! If a location closes or a new one opens, update your site accordingly and then update your NAPs across the web. Take a look at this nice article about common local SEO problems for other common issues you may encounter. So, should you go about implementing all of these items/optimizations on your location page? If you can in a sensible manner, I say go for it. You will primarily be limited by available resources and time. Just remember, it is important to take your time and develop a good, scalable strategy. As you can see, the sheer amount of optimization you can perform for your location pages is pretty vast. If you can put time into crafting unique, valuable location pages that are not meant to simply funnel users to other parts of your site, then you will see the benefits in the form of higher local rankings.